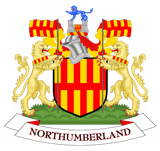 More than 50 young people attended an event at Northumberland County Hall in Morpeth yesterday for a showcase educational event. The pupils, who came from Stead Lane and Beacon Hill schools, took part in a workshop which was facilitated by Ex-Newcastle United player, Richard Offiong and Education Manager, Craig Bankhead. During the workshop, the young people had the opportunity to view Show Racism the Red Card’s new education film and take part in a Q&A with SRtRC’s team of ex-professional football players. Other members of the panel, representing Northumberland County Council, were Councillor Jim Smith - Chairman of the Council, Councillor Lesley Rickerby – Member for Children and Young People’s Services and Gill Finch – Diversity Officer from the Equalities Team. Questions from the young people in the Q&A included “How would you feel if your family received racism?” and “why is there so much racism in football?” the three winners of Best Question each received a t-shirt and other SRtRC goodies. All of the young people left with a football team poster signed by the ex-professional players on the panel.